I know it's been a while. I haven't posted in nearly 4 months but that's because I've been at university and it is so ridiculously busy, I feel like I haven't had a moment to myself. Still, I really like being able to look back at my summer and see what I did so hopefully I will be able to get back into it for Christmas; I may try to do Blogmas: a blog every day for December/Christmas. 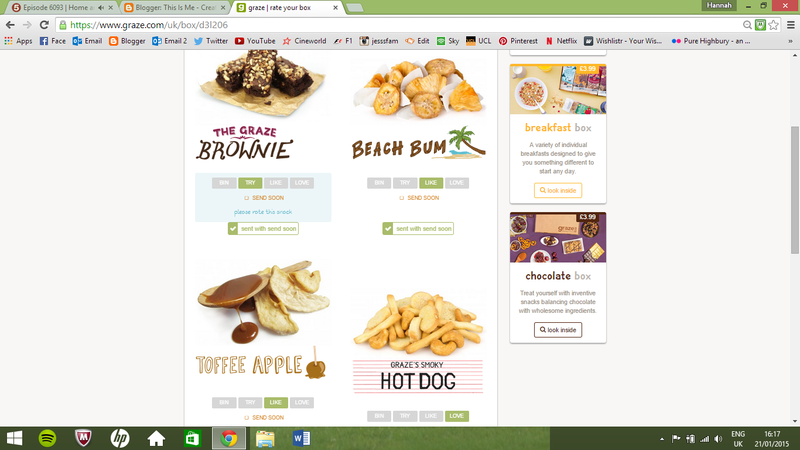 I just wanted to make a little post about a new healthy eating website: GRAZE! I have recently joined and being a fussy eater its hard to eat healthily. I think these are perfect. You can Bin, Try, Like or Love snacks and based on a this feedback, they send you the snacks. 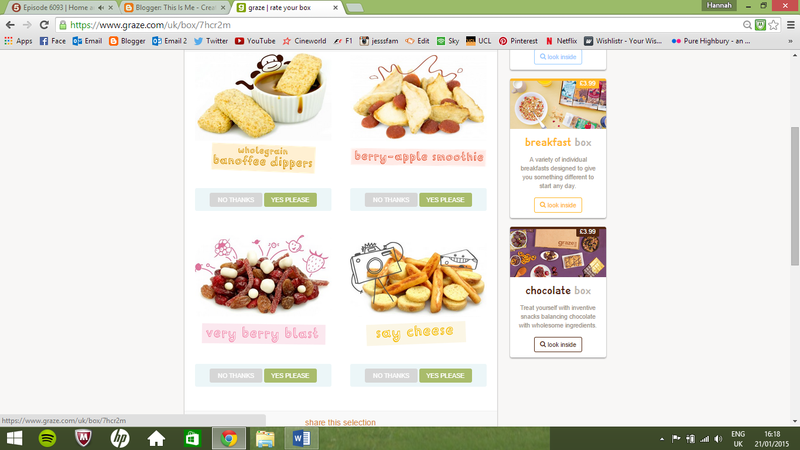 You can schedule the boxes to suit you and you can get up to 4 snacks a week. Perfect for lunchboxes. I have a discount which gives you your 1st, 5th and 10th boxes free! But shush...you can just have the first box for free and then cancel when you like! I think this might become a thing? This weeks snacks are my favourite. Because of the gap over christmas, I decided to get 2 boxes this week, plus I have a lot of trips and outings coming up. Once again, free 1st box with no subscription guaranteed, so it is basically free!